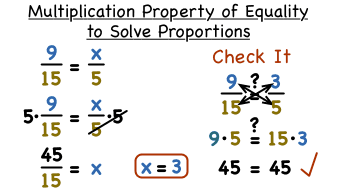 How Do You Solve a Proportion Using the Multiplication Property of Equality? Trying to find a missing value in a ratio to create proportional ratios? You could use the multiplication property of equality! In this tutorial, see how to use this property to find a missing value in a ratio. Take a look! How Do You Solve a Proportion by Finding an Equivalent Ratio? Trying to find a missing value in order to create a proportion with two ratios? Take the ratios in fraction form and identify their relationship. Use that relationship to find your missing value. This tutorial will show you how!